October | 2009 | Go Mommy! Question: What Song Gets Stuck in the Head of a Mom of Elementary-Aged Kids? Answer: If that mother is a runner, the stupid song is the Webkinz Gray Arabian song. I’ve included the link to the song for the very curious, but I’m warning you, DON’T CLICK THE LINK. Here it is: Link. Don’t click it. If you do, you’ll be singing the song for the next four or five months, too. Don’t do it. Seriously. On the other hand, at least the beat helps me keep a good pace. Sigh. Motherhood. Shelly was speaking a foreign language. What on earth was she talking about? Well, evidently most of us “endurance athletes” (I still chuckle at myself when I think of myself in those terms) experience pain over the long haul where our sweaty skin rubs against, well, anything else on those long runs. I hadn’t even thought about this, much less conceived that there might be a product to deal with the issue. But since I was fast approaching the day for my 5-hour run and the weather was expected to be in the 80’s with a heat index in the 90’s, I figured I’d best listen to whatever wisdom Shelly was willing to impart. The running community even had its own nickname for the outcome of this unfortunate experience: Chub Rub. Now being an ample person, I had plenty of opportunity for said chub rub, I’m sad to admit, so I was glad to hear there was a remedy! Since that conversation, I’ve been astounded to witness during the preparation phases of many races the many creative places where runners have used Body Glide (and other similar products) to prevent the chub rub. Some exceedingly un-chubby people have been spotted slathering it everywhere. One friend of mine even has it in a mini-size to keep it with her when she runs long races! And it works. This is not a product endorsement, because I haven’t been paid to endorse them, but I can tell you that the stuff works. And it’s one of the wierd little quirks of this running culture I’m glad to have picked up along the way, before having to face the dreaded chub rub personally. When starting something new, I tend to be kind of quiet about it, waiting to make Grand Announcements about my conquests until there seems like there might be some kind of potential for success. Chris, on the the other hand, is a different kind of gal. While I would have preferred to start my running program under cover of darkness, hiding my outta-shape self from the perceived criticisms of others, my buddy Chris was one bold cookie. She posted and chatted and talked about our adventures until now, quite unexpectedly, I was publicly committed to this journey as well. Back doors were quickly being closed, boats were being burned behind me. Quitting was quickly becoming a non-option. So we set out on a course for success. Now, whether Chris actually knew at the time that by virtue of being her wonderful self, she was shutting down my every excuse to bail out of our running gig, I really don’t know. But I’m really glad that she is who she is, because I wouldn’t have made it through the early stages of runningville without her. It was through Chris that I was (re)connected with my friend Shelly and connected with my new friend Jamie. Shelly had run a half marathon earlier in the year and was training to run a full marathon later in the year. 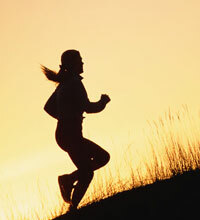 She was a Serious Athlete who was training for her marathon with Team in Training. And she saved my bacon many times, with her timely advice and words of wisdom. So it was that when Shelly suggested we all run a half marathon together in 2010, I said, Sure, without really thinking about it. We are now the Capital City Half Marathon Babes and will be burning up the course on May 1, 2010! Since I’d barely been able to crawl 7.3 miles, I knew I’d need a training program. Enter Dotty, another new friend and adult-onset endurance athlete. She was full of great advice regarding midlife training and coaching. She recommended the book that helped me figure this whole running thing out (at least so far). And she talked about a very cool half-marathon in Virginia Beach. That’s all it took. The matter was settled. I was going to see my brother and run in my first Big Race with him. Never mind that he was already an endurance athlete. Never mind that his legs are so long that his inseam reaches up to my armpits. Never mind that I was still hobbling from my first 5K walking and 7.3 mile trail experience. Never mind that the race was the first Sunday in September, less than four months away. Never mind that it was absolutely impossible. Somehow, after more than a decade of neglect, within weeks of getting my feet back into my running shoes, having never in my life moved my body more than ten miles in a given effort, I had committed myself to TWO half-marathons. It was official. I had lost it for real. And my craziness was evidence that I was truly on my way to becoming an actual Runner. This blog was named after my daughter M’s cheer. I hear it at almost every finish line, at some starting lines, and as I’m headed up the hill out my front door on lots of my workout runs. Sometimes I even hear it in my mind, when I’m having to push through or finish something hard. I never would have started running again had it not been for my daughters. And a few great friends. And a supportive husband. And my brother’s encouragement. And my mom’s help. And an awesome running club. And the grace of God. Why write about it? Because that’s what I do. Maybe you’ll be encouraged or entertained or edified as you visit here. For me, it’s a way of memorializing this unlikely journey so I can enjoy each footstep, in spite of my Type-A, goal-driven nature. It’s a way of sharing the trip with my friends, family and (ha!) fans. It’s a way of keeping my perspective and remembering what’s really important. And a way of keeping it real.